More formal, Western-style restaurants come in many shapes and sizes, from simple places serving unpretentious Vietnamese meals to top-class establishments offering high quality Vietnamese specialities and international cuisine. In the south, Indian and Thai influences add curries and spices to the menu, while other regions have evolved their own array of specialities, most notably the foods of Hué and Hoi An. Buddhism introduced a vegetarian tradition to Vietnam travel, while much later the French brought with them bread, dairy products, pastries and the whole café culture. Hanoi Vietnam, Ho Chi Minh City and the major tourist centres are now well provided with everything from street hawkers to hotel and Western-style restaurants, and even ice-cream parlours; in such places, you’ll also find a few restaurants putting on cooking classes. While most eating establishments stay open throughout the year, some close over Tet. 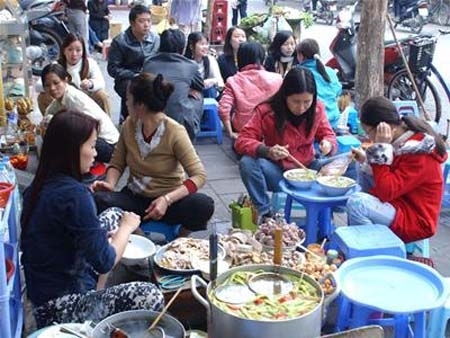 The Vietnamese eat early: outside the major cities and tourist areas; food stalls and street kitchens rarely stay open beyond 8pm and may close even earlier, though they do stay open later in the south, especially in Ho Chi Minh City. You’ll need to brush up your chopstick-handling skills, too, although other utensils are always available in places frequented by tourists – in Western-style restaurants you won’t be expected to tackle your steak-frites with chopsticks. When it comes to paying, the normal sign language will be readily understood in most restaurants. In street kitchens you pay as you leave – either proffer a few thousand dong to signal your intentions, or ask bao nhieu tien? (“how much is it?”). As with accommodation, prices are listed in dollars throughout the guide but exchange rates may be wildly different by the time you travel and the smaller, local establishments often prefer to be paid in dong. Most specialize in one type of food, generally indicated (in Vietnamese only) on a signboard outside, or offer the ubiquitous com (rice dishes) and pho (noodle soups). Com binh dan, “people’s meals”, are also popular. Here you select from an array of prepared dishes displayed in a glass cabinet or on a buffet table, piling your plate with such things as stuffed tomatoes, fried fish, tofu, pickles or eggs, plus a helping of rice; expect to pay from around 25,000? for a good plateful. Though it’s not a major problem at these prices, some street kitchens overcharge, so double-check when ordering. Menus at this level usually show prices, particularly in areas popular with tourists. If there are no prices on your menu, confirm them with staff before you start eating to avoid any potential overcharging issues. Prices vary considerably depending upon what you order, but you’ll get a modest meal for less than $5 per head. Opening hours at such places are usually from 10.30am to 2pm for lunch, and in the evening from 5pm to no later than 9pm, or 8pm in the north. As you move up the price scale, the decor and the cuisine become more sophisticated and the menu more varied. The more expensive restaurants (including the smarter hotel dining rooms) tend to stay open later in the evening, perhaps until 9.30pm or 10.30pm. Some have menus priced in dollars, and more and more accept credit cards. Usually menus indicate if there’s a service charge, but watch out for an additional 3–4 percent on credit card payments. These restaurants can be relatively fancy places, with at least a nod towards decor and ambience, and correspondingly higher prices (a meal for two is likely to cost at least $20 and often much more).